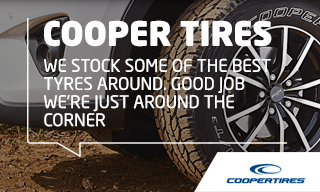 Cooper Tire is the 10th largest tyre manufacturer in the world and has more than a century’s experience at the leading edge of tyre technology. Cooper produces a full range of tyres for passenger car, van and 4x4 applications and are the sole supplier of specialist rallycross tyres to the FIA World Rallycross Championship. Cooper passenger car tyres are designed and developed in the UK to meet the conditions of British roads and the needs of British motorists. Cooper is the “Official Tyre Partner” of Arsenal Football Club. Discoverer A/T3 Sport – An all-terrain 4x4 tyre, manufactured in the UK and designed specifically for the European market. Available in a range of sizes to fit popular sport utility vehicles and light trucks. The tread elements are designed in pairs to promote excellent stability and confident handling. Discoverer A/T3 – Provides solid all-terrain performance, superior all-season traction, excellent stability, confident handling and reliable tread wear. The tread walls have been designed to aid reduction of stone retention, stone drilling and aid cut and chip resistance. If you are interested in a set of tyres at ATS Euromaster, particularly as the driver of an SUV or 4x4, then we offer a great range to suit your requirements. Should you want to replace the tyres that your car was factory fitted with, Cooper makes some excellent choices to replace them with. You can search for the type that is best for you by using our 'Find Your Tyres' tool or by going down to your nearest ATS Euromaster centre where one of our expert technicians will be able to determine which is the best product for you.